It is just day two of his presidency, and already Trump is taking a sledgehammer to the Obama legacy: in his latest move reported moments ago by Bloomberg, president Trump intends to sign two executive actions today "that would advance construction of the Keystone XL and Dakota Access pipelines", putting a spoke, so to say, in the train wheels of Warren Buffett's train-based oil transportation quasi-monopoly. Keystone was rejected under former President Barack Obama. 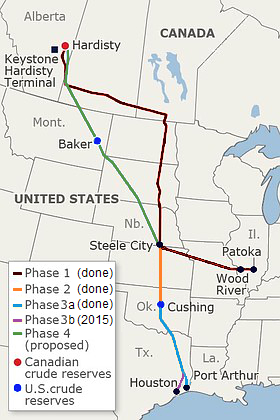 Trump’s move on Energy Transfer Partners LP’s 1,172-mile Dakota Access project aims to end a standoff that has stalled the $3.8 billion project since September, when the Obama administration halted work on land near Lake Oahe in North Dakota. Expect an angry reaction from Buffett, which will promptly flow through to funded environmental protest groups, who will double down in their defense of the two pipelines, of which the Dakota Access was the prominent center of media attention in the waning days of Trump's presidency.